Malcolm is feeling much better now. He felt well enough to work all day at the trailer on Tuesday, but had problems getting sleep that night. He was pretty much worn out on Wednesday morning and spent the day just relaxing. Thursday he was back at the office and worked Thursday and Friday there. He has been driving the truck into town this stay, instead of renting a second vehicle. Though our space is sort of small here at Jellystone (about 55 feet long), we’re otherwise enjoying the peace and quiet at the back end of the campground. All of the children-friendly activities and, thus, the family campers are all located towards the front of the park. We are also further away from the traffic noise on the Briley, especially the bridge over the Cumberland River which is close to the back side of the KOA. This afternoon we enjoyed sitting outside for a while, especially since our entire row emptied out and left us a decent view of something other than the broad side of a Class A RV. Saturday evening, we rode our bikes up to the ice cream shop in the park and had some pretty good hand dipped ice cream cones. 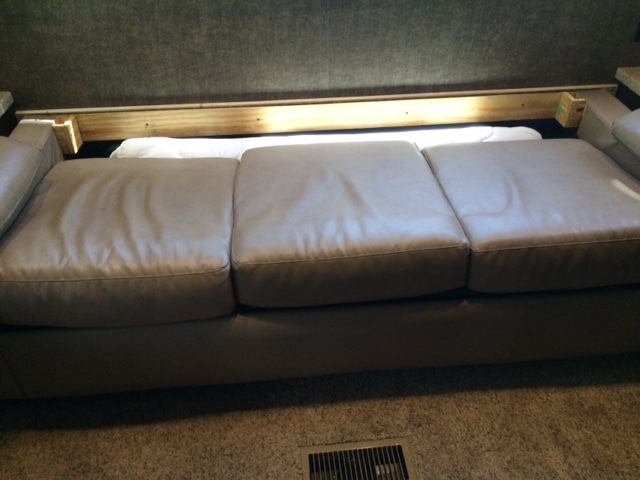 One fix/mod we did on Saturday is to better secure our couch to the back wall of the trailer. 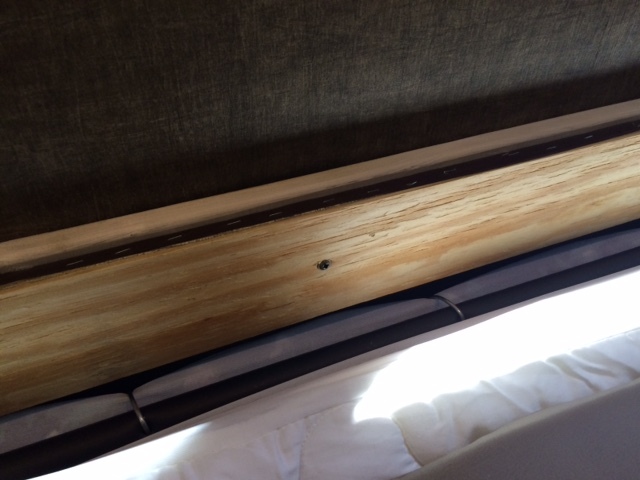 The factory had put two screws through the back board of the couch into the wall, but both screws were simply screwed into the wallboard, which did absolutely nothing towards anchoring the couch. 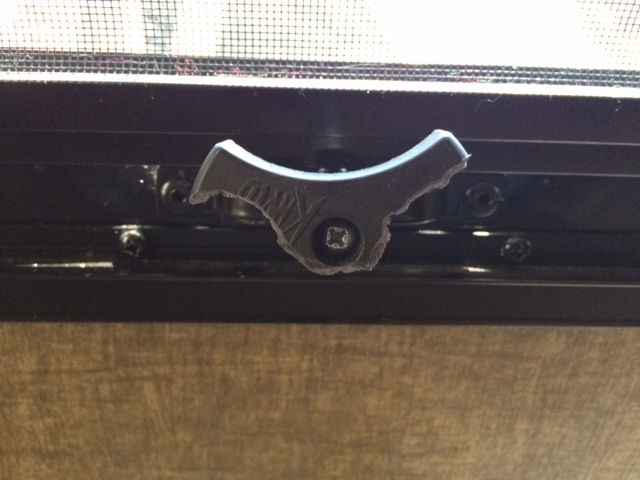 During a recent hard braking incident, we found that the couch apparently flipped foward and the back of the couch broke the handle on the window opener. We picked up an eight-foot long 1×4 and brought it home. 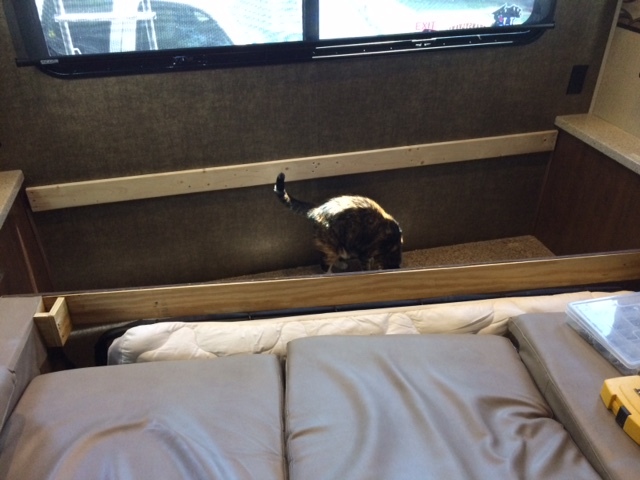 Malcolm cut it to length between the two “end tables” mounted to the side walls of the trailer. He was able to actually anchor the board to five different studs behind the wallboard, so it isn’t going anywhere now. We pushed the couch back against the new anchor rail and drove screws through the couch board into the anchor rail. The couch shouldn’t go anywhere now. Rail installed. Callie inspects the work. Couch pushed up to the wall and screwed into place. 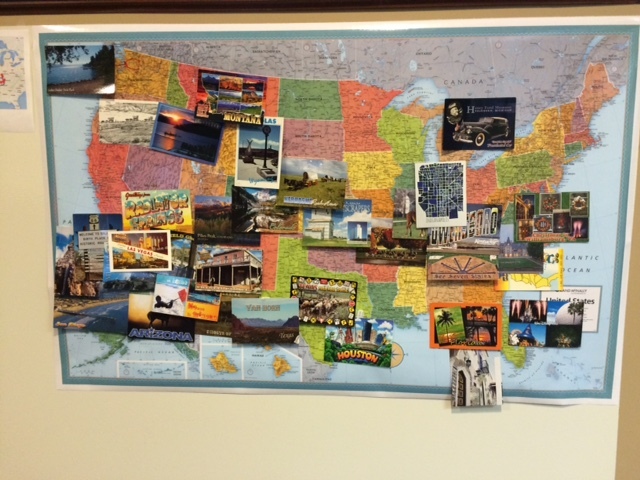 Other than that, we’ve just been doing a little shopping and preparing for our trip out west, which starts on Saturday, August 1st. 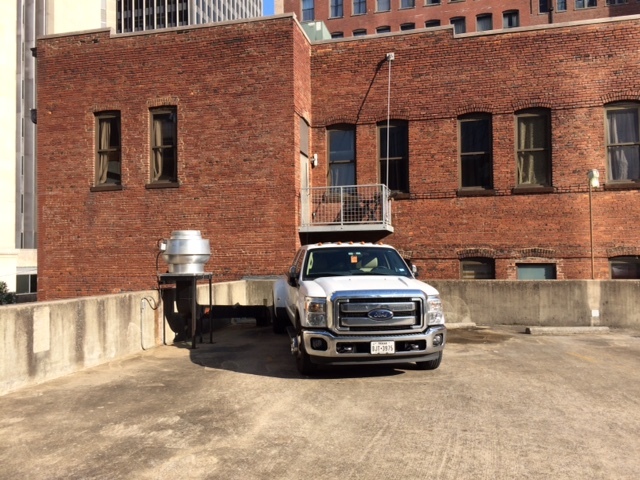 We will be getting the truck serviced in preparation for the trip sometime during the week.